This new year, many people are making diet changes in order to reach a healthier lifestyle. I think that now is a great time to make improvements in your diet. The best way to meet your goals is by making small changes that can lead to big results. -Replace refined grains with whole grains- This is one of the easiest changes you can make! Simply use whole grain products such as whole-grain pasta, whole wheat bread, oatmeal, etc. instead of refined white grains. You will most likely barely notice a difference and will be getting more fiber, protein and vitamins. -Avoid high calorie beverages- Drinks such as pop, juice, sports drinks, etc. have a lot of calories and little nutrition. Skip these beverages and instead drink water, unsweetened tea, coffee (limit to 1-2 cups/day) and low-fat or skim milk. -Drink lots of water- Water is great for staying hydrated and helping so that you do not mistake thirst for hunger. Did you know that you can feel tired if you are dehydrated? Stay hydrated to keep yourself feeling your best. -Eat a nutritious breakfast- I try to start each day with a nutritious breakfast such as Greek yogurt or oatmeal. This helps me to maintain a healthy diet through the day. If I start out with pie for example, I will crave more sugar through the day. Also, this guarantees you getting in some protein, fiber and/or whole grains first thing. -Add produce to each meal- I aim to eat produce at almost every meal. This helps me to feel my best and tastes great too. Breakfast can be the hardest meal to do this. For fruits, have blueberry oatmeal or whole-grain pancakes, a parfait with fruit or a smoothie. For vegetables, throw spinach, peppers, mushrooms, etc. in eggs. I teamed up with the U.S. Highbush Blueberry Council to discuss blueberries a bit. Blueberries are delicious! I went blueberry picking this summer at a local Michigan farm and could not stop eating the tasty blueberries we picked. Blueberries are naturally sweet and very nutritious as well. Blueberries can be eaten plain, using in cooking or all different types of recipes. Nutritionally, blueberries have 80 calories per cup, 3.6 g fiber and are a good source of vitamin C, vitamin K and manganese. 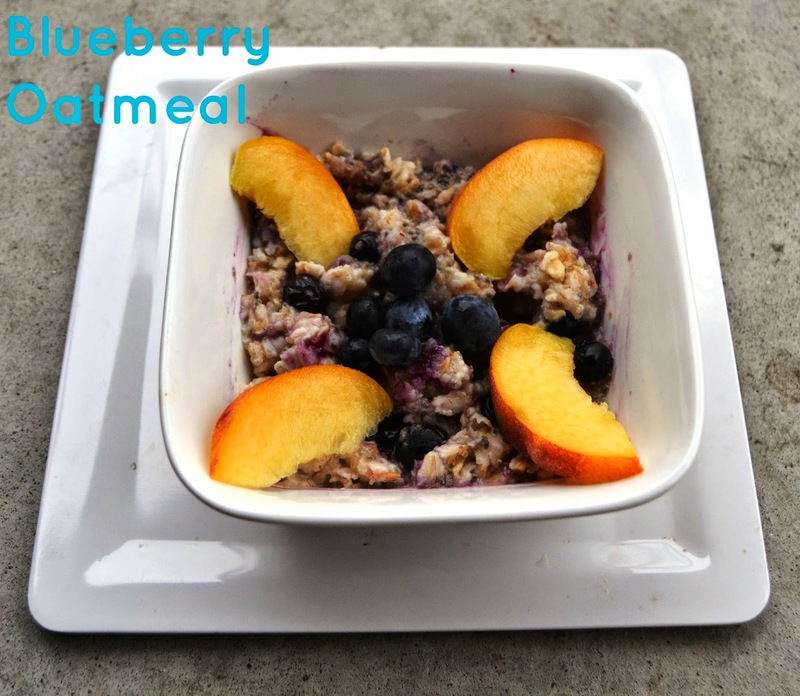 My favorite ways to eat blueberries are plain, in yogurt, oatmeal, waffles or frozen. If you have not tried them frozen, you need to. They become almost creamy tasting when frozen. Yum! 1. Place all ingredients in a microwavable container and soak overnight- this makes it super easy for cooking and allows the oats to soften and the chia seeds to sweel. Microwave for 1 1/2 minutes in the morning when ready to eat. 2. Cook on the stovetop until oats are tender. Use 1- 1 1/3 cups water if you use this method. The blueberry council is hosting a sweepstakes that you can enter to win a trip for 2 to LA for the Little Changes Kitchen Challenge with TV host, actress and author Alison Sweeney. Runners up can win 1 of 4 $500 Whole Foods or Lululemon gift cards (wow, I would love to win either of these). Sweepstakes go from now until February 16th.